Just over a year ago Sony launched one of the best looking console games of the modern era with Ready at Dawn’s narrative-heavy third-person steampunk shooter The Order: 1886. It was a technical marvel for spring 2015 and one that editor Richard Leadbetter called “a milestone in the development of next-gen visuals.” Indeed it still looks mightily impressive 16 months on. 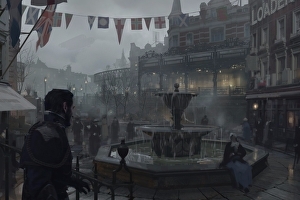 Yet for all its whiz-bang glamour, The Order: 1886 was met with a lukewarm critical reception and sales that only upon launch. Given all the hype Sony pushed upon this pristine monument to the PS4, it would be easy to assume The Order was a colossal failure. Maybe even a misfire capable of crumbling the studio behind it. Nothing could be further from the truth. Ready at Dawn is alive and well (I would know, having visited its Irvine, California headquarters last week) and its future is promising. Chief creative officer and co-founder Ru Weerasuriya confirms that the studio currently has three titles in development: the just announced physics-based brawler , an unannounced Oculus Rift-exclusive title, and a mysterious AAA game in pre-production. Weerasuriya can’t reveal the platform (or possibly platforms) or publisher of this unannounced blockbuster, nor can he confirm if it’s a new IP, but he does tell us about 20 staffers are working on De-formers full-time with a larger team on the Oculus title and the rest on the AAA game with more to join as other projects near completion.